Combining an exceptional printable surface with Metal Azo professional grade recording performance and reliability, Verbatim Printable discs are the ultimate choice for developing, customizing and distributing DVD content. These discs have been extensively tested and qualified for use with inkjet and thermal disc publishing systems. Perfect for low volume DVD duplication, these discs allow users to customize their DVD titles with beautiful full color art. Verbatim DVD-R offer 4.7GB or 120 Minutes of write-once storage capacity, superior recording quality, and compatibility with 1X to 16X DVD-R writers. 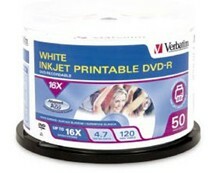 Verbatim 16X DVD-R discs allows users to record a complete 4.7GB/120Min disc in approximately 5 minutes. Recognized as the choice of professional users, Verbatim DVD-R offers the optimal “Advanced Azo” recording dye, which provides the highest level of read/write performance, reliability, and archival life. Verbatim 16X DVD-R media is compatible with Pioneer, Apple, Sony, Panasonic, Microboards and Rimage. As with all Verbatim optical products, these discs are backed by a Limited Lifetime Warranty. Inkjet, thermal and thermal retransfer printing surfacs are available in silver and white printing hub printable surfaces.